By Tom Kertscher on Monday, June 25th, 2018 at 6:00 a.m.
Wisconsin Republicans are hoping to deny Democratic U.S. Sen. Tammy Baldwin (center) a second term in the November 2018 elections. 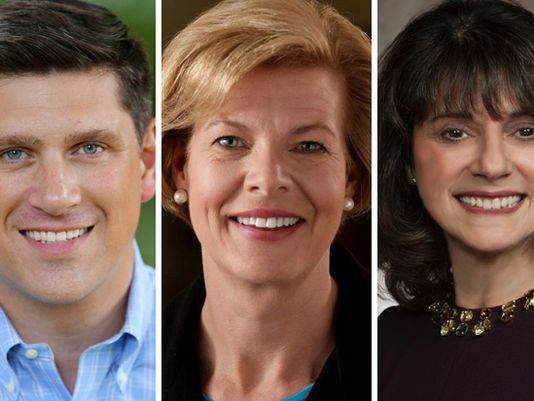 Vying for the GOP nomination to challenge Baldwin are political newcomer Kevin Nicholson and state Sen. Leah Vukmir. Go here to see our new roundup of 2018 campaign fact checks on the two U.S. Senate nominees, Tammy Baldwin and Leah Vukmir. Here's your running scorecard in the 2018 Wisconsin U.S. Senate race. We’ve been fact checking, and applying the Flip-O-Meter to (for consistency on an issue) each of the major candidates: Democrat Tammy Baldwin, the incumbent; and Republicans Kevin Nicholson and Leah Vukmir. The primary is Aug. 14, 2018 and the general election is Nov. 6, 2018. The most recent items for each candidate are listed first. Nicholson: "New reports show Kevin Nicholson made over $1 million advising companies that shut down Wisconsin plants and laid off 1,900 people." Mostly False. Immigration: What Baldwin said in a CNN interview about immigration that Nicholson keeps criticizing. In Context. Immigration: Says Donald Trump's executive order "doesn't address the over 2,000 children who are already separated from their parents, and it doesn't change the fact that we would be jailing children with their families." Mostly True. Cheese: Says that "when federal bureaucrats wanted to prohibit the use of wooden cheese boards, which help make tens of millions of pounds of cheese a year" she "stepped in, helped eliminate the regulations." Mostly True. Guns: Says 97 percent of gun owners support universal background checks. Mostly True. Guns: The Las Vegas shooting was the "273rd mass shooting" in the United States so far in 2017. Half True. Trump: Says Donald Trump "wants to kick thousands of kids off of BadgerCare." Half True. Trump: Says Leah Vukmir said: "I’m not endorsing Donald Trump." False. Flip-O-Meter: On support for keeping Kentucky Republican Mitch McConnell as Senate majority leader. Half Flip. Iran: The Iran deal "handed billions of dollars of cash on cargo planes, sent it to a state sponsor of terror, and Tammy Baldwin was one of the first U.S. senators to get on board and support that." Mostly False. Baldwin: "Tammy Baldwin cosponsored legislation that wanted to establish the Department of Peace and Nonviolence." Mostly True. Supporters: Says conservative mega-donor Richard Uihlein is a Wisconsin resident. False. Military: Saying military service is a "conservative value" and questioning Democratic veterans' "cognitive thought process." In Context. Guns: "There are more guns in this country than there are people." Half True. Ex-Democrats: "Ronald Reagan was a verified Democrat until his mid-50s." True. Trump: "I have always been there with" Donald Trump. False. Baldwin: Says Tammy Baldwin's record includes "opposing harsher punishments for criminals who commit violent crimes near schools." Half True. Patriotism: Tammy Baldwin "opposed displaying the flag and reciting the Pledge of Allegiance or singing the National Anthem in our classrooms." Mostly False. 'Leniency': Claim by Club for Growth: Leah Vukmir "wrote a letter seeking leniency for a fellow state legislator convicted of sexual assault." Mostly True. Immigration: Says Mark Pocan’s proposal to eliminate the U.S. Immigration and Customs Enforcement (ICE) would "eliminate border enforcement." Pants on Fire. Immigration: On separating families at the border. Half Flip. Baldwin: Says Tammy Baldwin is "more worried about the mastermind of 9/11" than supporting CIA director nominee Gina Haspel. Pants on Fire. Baldwin: Says Sen. Tammy Baldwin "claims to support a 'Buy America' philosophy, but her actions speak louder than her empty words." False. Crime: In 2016, there were 5,570 people in Wisconsin "who committed crimes on probation and they were not revoked." Half True.